The monastic Community and the population of Finalpia has a big debt of gratitude toward Fr. Leandro Montini (1885-1958) of whom only the elderly preserve a direct memory today remembering perhaps also the affirmations of esteems that we can read in the Memories of Marshal Caviglia. These short notes therefore would present at least some traits of his personality to avoid that his memory becomes so small to disappear completely. Native of Osimo (An), Father Leandro becomes monk of the abbey of Finalpia in 1907, two years after the reopening of the Benedictine community, that ended the long period of absence of the monks due to the expropriations of the nineteenth century. Father Leandro can be considered therefore to belong to the small but generous team of monks that at the start of the twentieth century, between thousand uncertainties and difficulties, they did reestablish Finalpia’s monastery. And Fr. Leandro was founder in the fuller sense of the term, he did everything possible, counting on his studies at the Academy of Fine Arts in Rome, to complete the construction of the monastery, interrupted by unfavorable circumstances, at the end of the sixteenth century. Of the two cloisters programmed at the beginning, in fact, only three sides (two for the first and one for the second one) had been built until then. Since the first postwar period Fr. Leandro started the job, and finished after the Second World War, he was able to overcome every obstacle of technical nature harmonizing wisely the new parts with those already existing. The visitor can therefore admire the nice and airy arcades of the cloisters that contribute to give to the monastery his unmistakable features. During the second World War Fr. 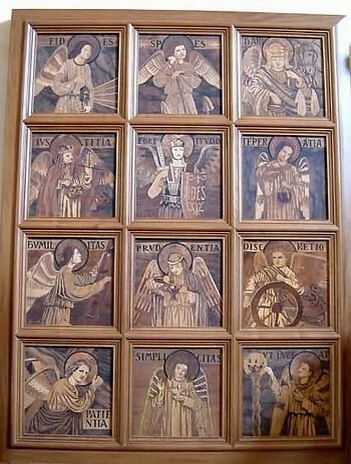 Leandro painted the inner chapel of the monastery that contains an original and suggestive representation of the liturgical year in his principal components from Advent to Pentecost, and the cycle of saints, with the representation of some saints, especially those ones whose names the monks had at that time. Here, however, we want to pause particularly on one of his artistic genre, between many practiced by Fr. Leandro (painting, sculpture, miniature, incision) and that is the "inlay" also because his work has been kept aside for long time and only recently has been displayed in a dedicated room. The recent upgrade of the chapter house give occasion to show twenty-four wooden tiles (cm. 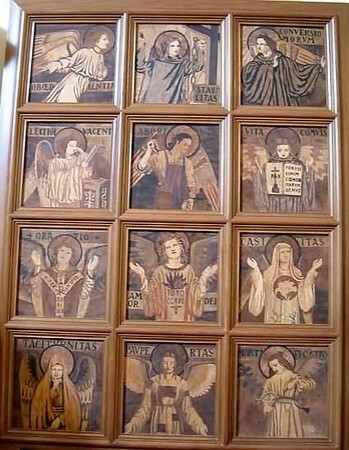 28 X 29 each) made by him with the intention to insert them as stall’s back in the choir of the above-mentioned chapel. The plan did not take place and the inlay wooden tiles have been for half century without a proper location. Only in the spring of 2001, after a general restoration of the chapter house, the wooden tiles have been placed in this room, inserted in two big panels (twelve tiles each) leaned against the side’s walls. Not a casual location because in this room since a century ago, there are inlay and carved stalls made in the sixteenth century by Brother Anthony from Venice for the monastic community founded in Finalpia in 1476. 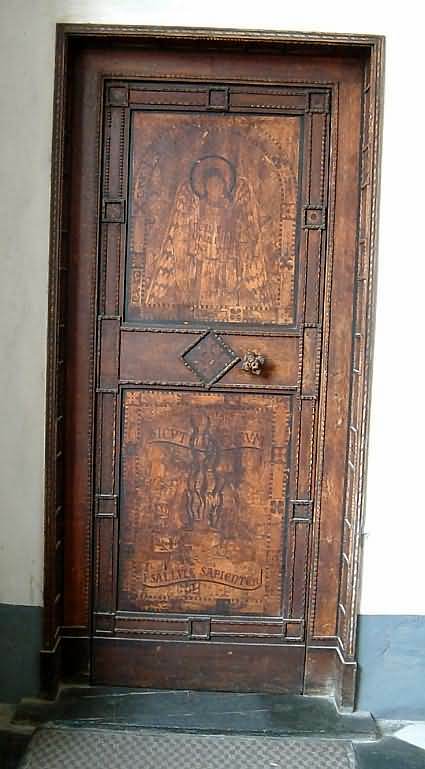 During the last four centuries this choir, made by sturdy stalls in walnut-tree, it had not been painted and the passing of time had contributed to make it very dry and colourless. 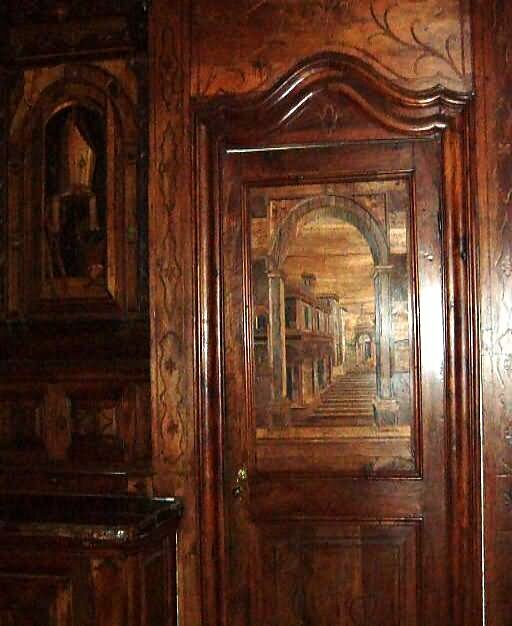 The community has therefore recently provide to painting these ancient stalls giving back to this room a brighter and pleasant appearance, during the winter 2000 has come to light a beautiful sixteenth century door made in Pietra del Finale (local stone) now closed by two glass wings. Between the choir made by Brother Anthony from Venice and the wooden inlay tiles by Fr. Leandro intervene four centuries but the combination of the two works so distant in time, located in one place does not create any contrast, not only because both are in wood but also because we know Fr. Leandro was faithful to an artistic traditional and figurative inspiration. The twenty-four tiles, in which the image of a symbolic character stands out, represent each one of the virtues whose Latin name is reproduced on the same. It is like a small gallery of symbols remanding those virtues that today we have even lost their meaning. Keeping in mind the peculiarity of the technique of inlay we are surprised not only for the accuracy of the drawing but also for the expressiveness of the figures, the variety of the attitudes and the reality of the faces, while the undulations of the drape give a suggestive chromatic effect. Though in a certain solemnity of position the figures are fairly diversified, vivacious and animate by a movement that show their true nature. They possess a human importance that sends out a message easily perceivable by the spectator. Despite his symbolic finality, each tile has his vitality and autonomy that is worth of all the technical expedient, from foreshortening to the light and shade from a shade tone to full brightness, able to communicate a sense of harmony and peace. 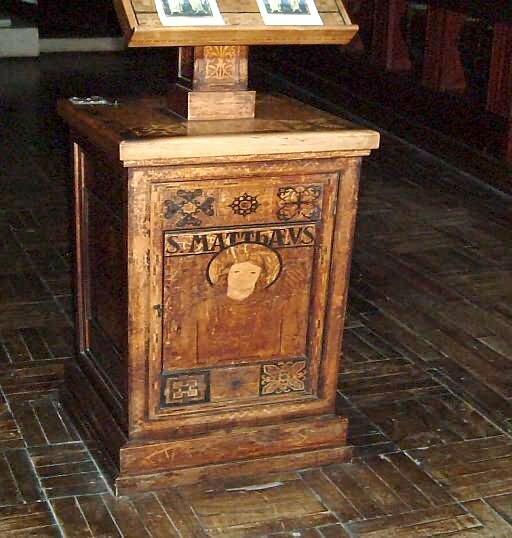 Probably in these work of inlay, to which we should add, the lectern and the inner chapel’s door, Fr. 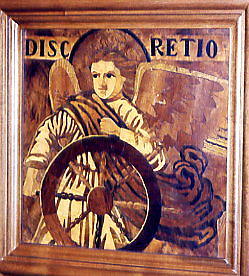 Leandro has given the best of himself in the artistic field and has revive with honour the commitment, that in that genre, four centuries ago, the monks had displayed in Finalpia, in first place the work of Brother Anthony from Venice, some of his works are still kept in Finalpia Abbey in spite of past difficult circumstances. New and old things, as admonishes the Gospel and as well the Rule of S. Benedict repeats, they are placed side by side and together contribute to the elevation of the soul in his incessant search for God.